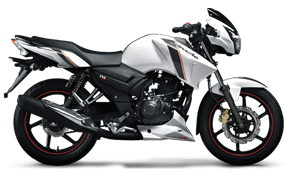 TVS Motors introduced the Apache brand in India in 2007 and the Apache RTR 160 is its first bike under the Apache series of the Indian market. The 'RTR' stands for 'Racing Throttle Response' and the motorcycle is designed with a racing approach. The company has installed several helpful things on the bike such as the lap timer in the instrument console and provision for the last three 0 to 60kmph timings. It is also the first bike in India to feature a petal disc brake. The bike has 17-inch alloy wheels on the front and rear with 90 mm section tyres at the front and 110 mm section tyres at the rear. The front forks have a travel of 105mm and the motorcycle comes equipped with a MIG dual springs at the rear. The Apache RTR 160 is powered by a single-cylinder four- stroke 160cc engine which produces 15.2bhp of power at 8,500rpm and 13.1Nm of torque at 4,000rpm. This motor comes mated to a five-speed gearbox. The competitors the Honda CB Hornet 160R, Suzuki Gixxer and the Bajaj Pulsar NS160. The Apache has been priced at Rs 76,575 (ex-showroom). The Apache RTR 160 is a popular bike in the 150cc motorcycle segment. The bike has been available at Rs 79,154 (ex-showroom- Delhi) and it was recently made BS-IV emission norm compliant. The looks of the bike are similar to that of the Apache RTR 180 and it was last given a design update in 2012. The sharp and sporty look is something that helps the TVS Apache rtr 160 stand apart from its competitors. Sharp design elements, including LED DRLs with pilot lamps, lend the Apache RTR 180 looks. The motorcycle also gets a lot of faux carbon fibre finish panels that are a neat addition. The bike sports an instrument cluster with a large analogue tachometer. The clear lens LED tail lamp looks great and the black finish on the alloy wheels and engine give the bike a good contrast. A top class bike, with the fine engine, looks and great specification which makes it a first-class choice for everyone. This is a bike of today's generation where speed and looks matters with great specifications as well. Powering the TVS Apache RTR 160 is a 159.7cc displacement single-cylinder, air-cooled engine delivering 15.3PS at 8,500rpm and peak torque of 13.1Nm arrives at 4,000rpm. The engine is mated to a 5-speed gearbox. The 150cc motorcycle employs a diamond type frame. Suspension duties are handled by telescopic front forks and twin shock absorbers at the back. Braking is provided by petal disc brakes on both the ends while ABS isn’t an optional extra as seen on the TVS Apache RTR 180. It has tubeless tyres and the bike weighs 137kg. The TVS Apache RTR 160 competes against the Bajaj Pulsar 150, Honda Unicorn 160, Yamaha SZ-RR Version 2.0 and Hero Xtreme. The Apache RTR 180 is powered by using a carbureted air-cooled single-cylinder 177cc engine producing 17.3bhp and 15.5Nm of torque. The rev-happy engine is mated to a five-speed manual gearbox with great specifications. The Apache 180 ABS is one the nice bikes from the TVS strong and has been evolved keeping the global racing tradition in mind. The motorcycle appears very competitive because of its sharp layout factors and gets LED mild with pilot lamps. The tank, engine and tail cowls get aerodynamic race designs and are decked up with a respectable quantity of decals. By way of far the brand new TVS RTR 200 V4 is the most masculine looking alternative inside the Apache series, although there's a fair amount of similarity with the rest of the RTRs making it identifiable with different Apaches. Power generation is performed by means of an all new 198cc engine which promises respectable output.